In the following arrangement the system is initially at rest . The 5 kg block is now released . Assuming the pulleys and strings to me massless and smooth . 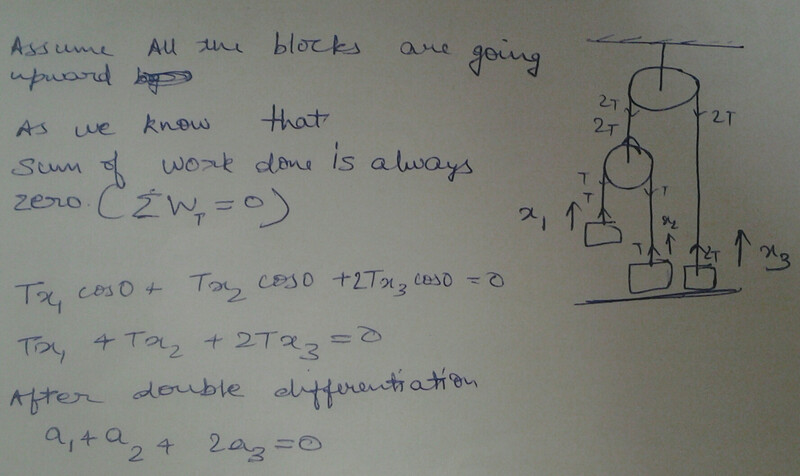 We have to relation between acceleration of all blocks . Your attempt is correct. Your method works because the tensions in the ropes are internal forces, and the sum of work done by internal forces is zero. Work done by one part of the system is work done on another part of the system. "The system" here consists of the 3 masses and the moving pulley. To get more equations, so that we can solve for the accelerations, we have to consider external forces - eg the pull of gravity. An important observation (which I overlooked) is that blocks B and C are initially at rest on a floor and cannot move downwards. 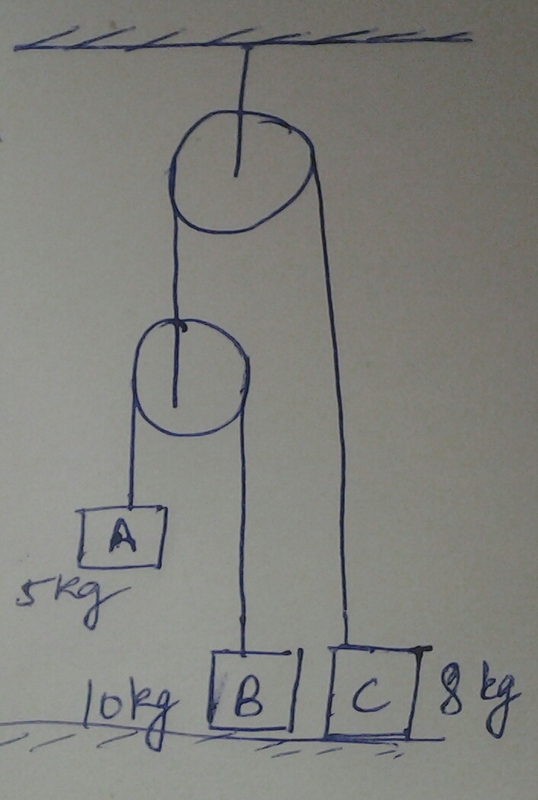 The weight of A+B > C, so C will accelerate upwards and the "free" pulley on the LHS will accelerate downwards. Since the system starts from rest the direction of acceleration is also the direction of velocity - ie motion. So either A or B (or both) will move downwards. Since the weight of B > A then B would move down - if it were not prevented by the floor. So it must be that A moves down while B rests on the floor $(a_B=0)$. Applying the restraint equation this leaves $a_A=-2a_C$. My mistake is that I did not realise the blocks B and C are resting on the ground. I have assumed that B can go down, but it cannot because of the floor. This is clearer in the diagram in the link. This immediately gives $a_B=0$ and $a_A=2a_C$. After which, the solution is a lot simpler. I shall revise my answer later.